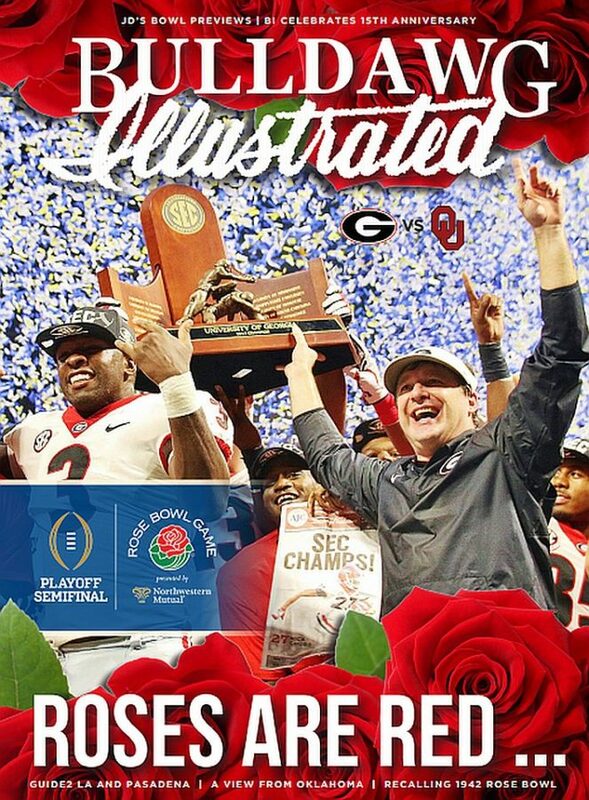 Bulldawg Illustrated is proud to bring you issue No. 16 for 2017 for Georgia’s first ever appearance in the College Football Playoff Semifinals and there second trip to the Rose Bowl… some 75 years after their first one, titled ROSES ARE RED. Inside you will find 48 full-color pages chock full of goodies that include articles previewing the Rose Bowl game between Georgia and Oklahoma from Jeff Dantzler and Murray Poole along with social features which include Cheri’s PROUST interview with UGA Alumna Ashley Hanna on page 35 as well the Guide 2 Los Angeles and Pasadena starting on page 36. Don’t miss Hamilton Culpepper’s What’s the Word interview with BI editor and owner Vance Leavy starting on page 44. Plus, we have those incredible fan photos that everyone loves. All this and much, much more! MISS OUT ON A PREVIOUS ISSUE?